May/June is both the best and worst time of my year here in Beijing. The school year ends, bringing a season of celebration – graduations and other school events, especially. As universities in the US and elsewhere in the northern hemisphere also finish up, college students who attended youth group in Beijing come back to visit, resulting in joyful reunions. On the flipside, it’s also a season of difficult goodbyes. The end of the school year also tends to mark the end of many families’ time in Beijing. My church expects to lose 30% of the total congregation every year. Last year the youth group lost 50% of our regular students. This year we have lost a lot of super-involved families. As an example, a few months ago I cleaned out the contacts on my phone, getting rid of entries for people no longer living in Beijing. Despite the phone being only 9 months old, I removed 39 people. And that was also without deleting the most recently graduated seniors. Many of them come back to visit, often using the same phone number, but mostly I just couldn’t bring myself to delete them. But yeah – 39 in 9 months. And that’s just people I had listed in my phone contacts. It’s all part and parcel of life in an expatriate community, especially for the Third Culture Kids I work with. Constant goodbyes form a pretty significant part of the emotional landscape they grow up in. All in all, it’s a bittersweet time of year. 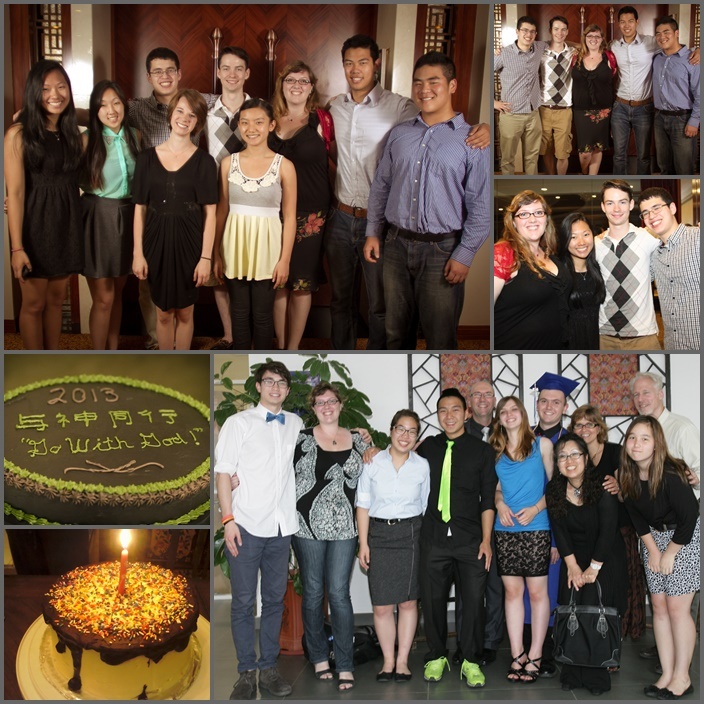 We celebrate the achievements of graduating seniors – who then say goodbye to everyone. And every joyful reunion with a returning friend means another goodbye when they leave again. Graduation in Beijing – celebrating graduates and reunions with those visting from other places. And of course, all the celebrations, events, reunions, and goodbyes make for a super busy schedule. For an introvert like me, the vast quantities of people-time becomes a little overwhelming, no matter how dearly I love all the particular people in question. The only thing holding my sanity together the past week has been the ability to take some time out by myself in the home of a family who are away for the summer. written letters in yearbooks/gift books to many graduates. visited two close friends and their brand new baby girl. attended a musical written and directed by a young woman who attended the first Beijing youth group I was involved with, 8 years ago. attended the baccalaureate for 10 of our graduates (a parent-led prayer and commencement service). seen about 8 of our youth group kids be baptised. dropped two friends off at the airport, also running into old friends on their way out after a few days in town. cooked dinner for a friend and her kids. had several long lunches with youth group kids, both those back visiting and those about to leave. received donated and cheaply sold items from several friends moving away. had our last youth group meetings for the year, including praying for the many kids leaving town and kids having a chance to share a little about what this year and these people have meant to them. received a few lovely notes and emails from students who are leaving. attended the weekly dinner/games night the family I live with host – for the first and probably last time (it’s always on a youth group night). had dinner on the other side of town with four of my favourite people, none of whom I see regularly. randomly met up with a returned college student I hadn’t seen yet at a bus stop – such a lovely surprise! played games in a mostly empty house with a family I’m very sad to see go. said last goodbyes to FAR too many people I may never see again. Top: Baccalaureate service in Beijing. Bottom: cakes and graduation in Tianjin. Oh, and I also had my birthday in the middle of all that. On graduation day, actually. 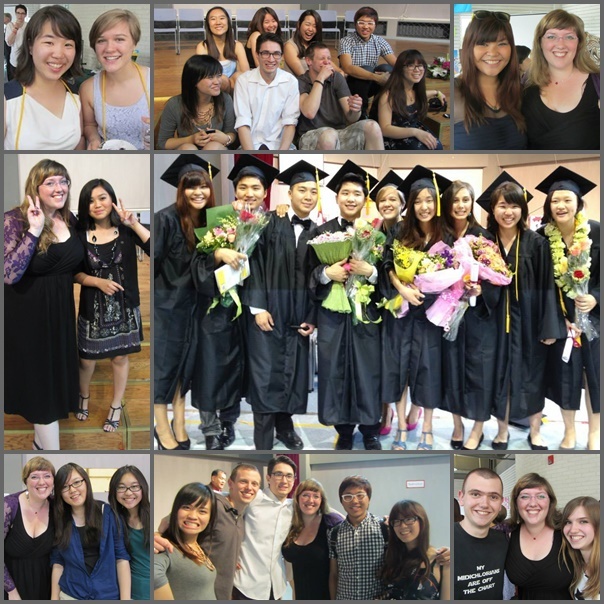 (Three international schools held their graduations on that same day, but I only made it to one of the three.) It’s hard to fit much of a celebration in between so much activity. I had birthday lunches the last two years – one very casual and one a surprise I knew nothing about. This year I’d known months in advance it would be graduation day so I didn’t even try, and it really didn’t bother me. My sisters both called me – one from Australia and one from her holiday in Malaysia. I also had a lovely unexpected call from friends in my hometown. A few small presents, including a box of my favourite Lindt chocolates, didn’t hurt either. And I got lots of Melinda cake! She makes the best cake in the city, and I had it three days out of four – on my birthday at the graduation, the next day at the baccalaureate, and two days later at her house eating the birthday cake she made for me and another friend. On top of everything I have also been preparing for my upcoming travels. On Wednesday I leave for Cambodia, then on Saturday six people from Beijing will join me there. We’ll be helping with a 5-day summer day-camp for TCKs. Then I’ll have about 24 hours back in Beijing before leaving for 3 weeks in Western Australia, visiting my sisters. So I’ve been buying supplies for Cambodia and presents for my sisters, along with other China goodies they want to buy. So, like I said, it’s a busy time of year. To all those people who have written me emails that have gone unanswered, I’m sorry! I will catch up with them all eventually. But at this time of year, just getting by is achievement enough.